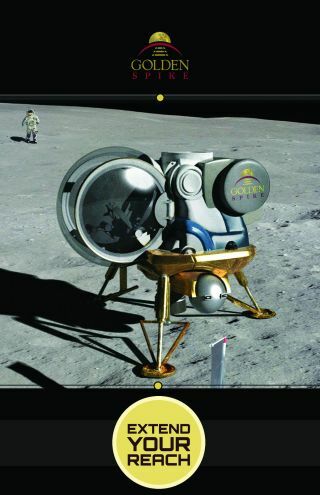 An artist's illustration of a Golden Spike Company moon lander on the lunar surface. The commercial spaceflight company Golden Spike – which aims fly private missions to the moon by 2020 – has teamed up with the New York-based firm Honeybee Robotics to design robotic rovers for the planned lunar expeditions. "We're very proud to be working with Honeybee, which has tremendous experience and a record of successful performance in the development of flight systems for NASA," Golden Spike President and CEO Alan Stern said in a statement last month. "Honeybee brings a unique body of knowledge and skills to help us augment the capabilities of human exploration missions with advanced robotics," Clive Neal, a researcher at the University of Notre Dame in Indiana and chair of Golden Spike's lunar science advisory board, said in a statement. "Their participation is a key step forward in helping Golden Spike change the paradigm of human space exploration, through the development of highly capable lunar exploration system architecture for customers around the world." Honeybee Robotics has been designing planetary sampling devices for clients including NASA and the US Department of Defense for more than 25 years, and has contributed to the last three of NASA's Mars landers: The company designed the rock abrasion tool for NASA's Mars Exploration Rovers Spirit and Opportunity, as well as the icy soil acquisition device (or "Phoenix Scoop") for the U.S. space agency's Phoenix Mars lander, and the sample manipulation system and dust removal tool for the Curiosity rover. Golden Spike officials initially priced the missions at $1.5 billion per person, but has since estimated that the cost could drop down to about $750 million with the help of media coverage and sales of merchandising rights of the missions, Stern told reporters last year at the 29th National Space Symposium in Colorado Spring, Colo. Potential moon flyers include leaders of nations, large corporations, and independently funded individuals. The companies plan to complete preliminary tests of their rover design by mid-2014.